The Magic Thief was one of my favorite books of 2008. It was one of the first books I read for the Cybils that year, and it stayed firmly in the small group of books I was determined to push onto our final shortlist of elementary and middle grade speculative fiction. Happily, no pushing was required. The passage of years has not changed my opinion-- it is a great book for a ten or eleven year old fantasy reader. It has an interesting story, endearing characters, fascinating magic, a tough older man (Bennet) who knits and bakes biscuits (so few middle grade novels shatter gender stereotypes, and this is one of the best examples going!). 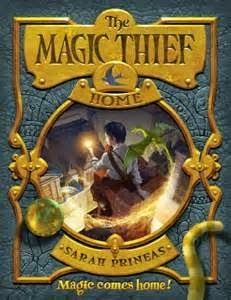 Then came The Magic Thief: Lost in 2009, and The Magic Thief: Found in 2010....which were kind of sadder, so it was harder for me to love them personally as much, and then Sarah Prineas wrote a whole different trilogy (Winterling, Summerkin, and Moonkind), which was lovely too, but it resulted in a long and anxious wait for those of us (like me and my target audience member child) who love Conn and co. to pieces! Now another Cybils season is here, and lo, The Magic Thief: Home (HarperCollins, September 2014) is not only in the world, it is on the list of nominated books, which means that I actually read it (all to often I fall into the trap of buying books I really really want to read right when they come out, and then letting them sit because, uh, I know I'll enjoy them....so at least this one didn't have too terribly long to wait). It is a fourth book, and so best appreciated by those who loved the first three. The action is somewhat slow to get going--Conn, his memories now restored, and his magical dragon Pip at his side, is trying to figure out his place in the world. And so we meet old friends, see trouble beginning to brew, see Conn not being happy with what other people want him to be....and then Trouble starts, and things really get hopping. An old enemy has returned to the city, and the fragile peace that Conn has brokered between its two magics is in jeopardy. As is Conn's life, and the life of dear Pip the dragon, and lots of other things too. It's all very satisfying. Those who liked the first three books will like this one too. Conn's sentimental attachment to the black sweater Bennet knit him. The nascent romance between Rowan and Embre, and the fact that Embre is a character whose badly broken legs means he uses a wheelchair but that this does not define him. And most of all, the fact that this particular happy ending is one that satisfies my maternal heart--Conn is really truly home at the end. And having a home where you are loved and your gifts and quirks of personality are appreciated is about the best ending there is. Rowan and Embre!!!! I fully on board that ship! I was so excited about that. You are spot on about the first Magic Thief's appeal--Elliot read it when he was about that age, and we just read it to Camila, who loved it. Looking forward to Home myself! Face it, it's the fireplace, biscuits and tea that sell this one to me. I'm still waiting to hear back from Jonathan Stroud to see if Lockwood and Co. need an office manager. Sigh. Awww, this is such a loving review of a series that has clearly been very special for your and your family. I'm adding the first book to my TBR list as we speak. Thanks for the recommendation!